The Central Ohio Innovation Center is an economic development and planning initiative spearheaded by the City of Dublin. This initiative is focused on creating a self-sustaining economic region within the western border of the City limits, at the interchange of Post Road and Route 33. The area covers approximately 1,300 acres. The Plan creates an environment that supports and enhances the City’s community principles of Live, Learn, Work, and Create. 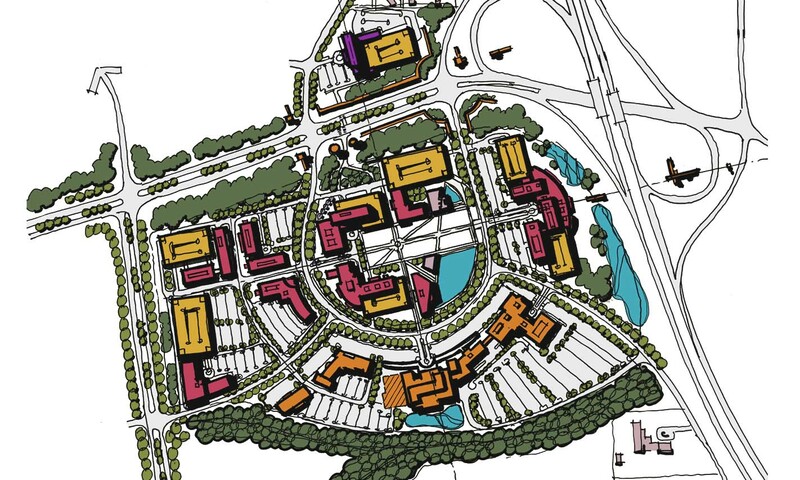 O’Brien Atkins’ planning services included a Concept plan that shows how to grow the 1,300 acres into a technology and medical research center, while preserving the environmental character of surrounding Dublin. The plan lays out a framework of roads, greenways, open space and parcels for development. Several schematic designs accompany the concept plan showing how developers might use the available parcels. Design Guidelines will also be developed as a means to steer the growth into a unified vision. O’Brien Atkins also coordinated the development plans of the interchange and the first anchor tenant, UMC Partners and The Ohio State University School of Medicine, to ensure compatability with the Innovation Center.